NEW YORK, New York, April 4, 2015 (ENS) – The sleek BMW i8 with the gull-wing doors, a gasoline-electric hybrid, has been declared winner of the 2015 World Green Car of the Year. The announcement was made at the opening of the New York International Auto Show at Javits Center in New York City. Due to the complexity of some of the advanced automotive technologies, five “green experts” are appointed annually by the World Car Awards Steering Committee to extensively review all documentation and specs associated with each candidate. The 75 World Car Awards jurors then voted on the experts’ recommendations in February; their ballots were tabulated by the international accounting firm KPMG. 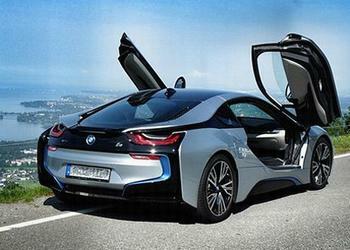 The BMW i8 was chosen from an initial entry list of 10 new vehicles from all over the world. A short list of three finalists that included the winner was rounded out by the Mercedes-Benz S 500 Plug-In Hybrid and the Volkswagen Golf GTE. This is the second year in a row that the BMW Group has won the World Green Car title. The BMW i3 took it home last year. The Global Trends Report, co-presented by Prime Research and Autoneum just before the winners’ press conference on April 2 at the New York International Auto Show at Javits Center in New York. “With Autoneum’s lightweight and multifunctional products for acoustic and heat management in vehicles, smart innovations are making an important contribution to the future of the automobile,” he said. To be eligible for the 2015 World Green Car award, a vehicle had to be all-new, or greatly revised, in production and introduced for sale or lease to the public in quantities of at least 10 in at least one major market during the period beginning January 1, 2014 and ending May 31, 2015. Tailpipe emissions, fuel consumption, and use of an advanced power plant technology aimed at increasing the vehicle’s environmental responsibility, were all taken into consideration by the judges. The New York International Auto Show is owned and operated by the Greater New York Automobile Dealers Association. Over one million visitors are expected before the show closes Sunday, April 12.